Yes, yes, yes, yes–I agree totally, Other Julie. “The balance of ministry outside and inside your home is hard.” You said it beautifully. Thank you so much for reading, commenting, and understanding. Jewels, I know exactly what you mean–my shift started last year after Carter was born and continues today. That sharp edge of passion from writing and getting published has dulled, replaced with the need to make memories with my family and friends. I spend more time with God, praising Him for bringing me to this place in my life. I’m at a better place in my life–all because God graciously put a little boy in my life. Enjoy each moment! I’m so glad we’re sharing this time in our lives together–You and Carter and Caleb and me. Yes! It’s a better place in life. I’ve been waiting on this post since Caleb was born. Wow! It amazes me how often we go through life feeling we’ve got it under control (that we’re living well) and then He shows us how wrong we’ve been and how much better His gifts are. I wonder, Anna, if the Lord ever lets up? 🙂 I think He’ll just keep on, keeping on–nudging us into a closer walk with Him…..all the way to Heaven. Thank you for your friendship and patience with Grandma Jewels. I had to wait until I was ready. Which took a little longer than I expected. Thank you, Julie, for sharing your heart. Congratulations! What a precious gift. Thank you so much, Margie! Giving you a big hug in my heart! Can all take away something from your story. God is never finished with us. And I love the Grandma Jewels! Blessings my friend. And so grateful our daughters are friends. Grateful you and I are too! This is so beautiful, Julie! You are a very special person. God bless you and your precious family. Thank you, Sweet Rita. Means so much. Greater is He. Perfect words from you, as always. God speaks in very mysterious ways at times. He is the master and prayers to him for everything and when the time comes he will let us know. always by our side. So beautiful are the pictures and babies are all so very precious. I have the wisest blog-readers! You’re absolutely right, Sandy. Thank you. I’m hugging you in my heart. I sure hope you can feel it. I guess it never ends, does it, Carm? The way He keeps on rearranging our hearts? But I’m so grateful He does. Thank you. You’re such an encourager. Means so much that you read my posts–and understand them! Julie, again, you have spoken to my heart. I know just what you mean. I used to eagerly rush to my computer in the mornings to catch up on everything. But once I turned 60, I noticed my prorities changing. I started relaxing more, taking time to enjoy my hobbies and just sitting outside being quiet, talking to God and enjoying His creation. My joy also comes from just hearing how and what my grandchildren are doing. It makes my day! Congratulations again on a beautiful grandson. Tears sprung up (sprang up?) when I read your words. This. Is. What. I’m. Feeling! You nailed it. I’ve been spending time in crafts stores and I used to be afraid of them. Creative ideas are coming. Soft, gentle ideas. I’m also having ideas on how to nurture/love people. And it has something to do with aging, but it’s not a bad thing. It’s a BEAUTIFUL thing. I so wish we lived closer. You could teach me some crafting, I’m sure! You said it right. My heart is swelling. It’s swollen. yes, yes, yes. Agreeing with you in prayer, B.J. Hi Grandma Jewels – I love that name! And what a cute, young, grandma you are! I know how long and difficult this journey has been for all of you and therefore the extra blessing Caleb is. All in God’s perfect timing. Rilynn looks like she’ll be a wonderful big sister! Your post gave me pause because sometimes I don’t think I show love enough to my grandchildren. I need to work on that, especially the one that lives with me fulltime, making it hard to be a grandmother when I have to be a mother too. From everything I can tell, you’re a WONDERFUL grandmother! Oh sweet Julie…..how your heart must overflow with this precious baby….but even more, with this precious answer to prayer! This is just continued proof of our Father’s love; it had to be in HIS time, when all the stars and planets had aligned and everything was just right….not for this precious little boy to be born, but because his ENTIRE LIFE is already mapped out….so God had to be sure that the future was perfectly in line for this little one. And so it is and so it happened. A testament to your’s and Katie’s faith to continue on patiently waiting and praying….Romans 8:28 is paramount here: “And we know that in all things God works for the good of those who love him, who have been called according to his purpose.” Caleb has been called according to God’s purpose, just as you and Katie have been. And He will bless you all abundantly in every day going forward. 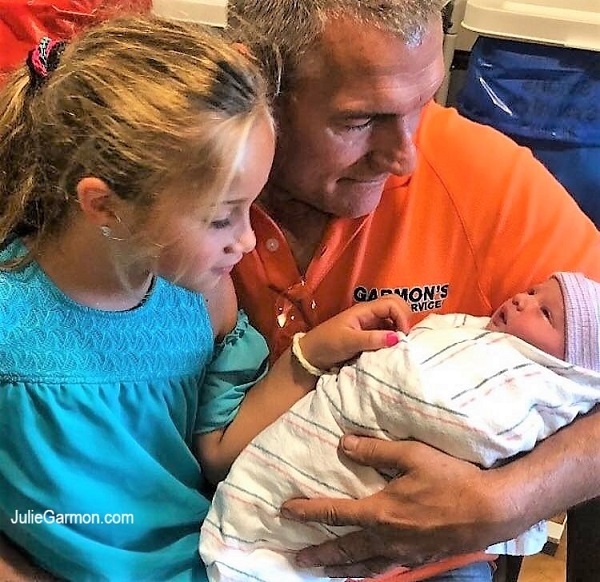 Julie….do slow down a bit and enjoy every moment of being a new gramma. We ALL understand! And we all love you! The grace you’re showing me melts my heart Chaplain DD. I can’t tell you how much your words ministered. Beautiful! Such blessing. Congratulations to everyone. Thank you, Terri! Means so much for my friends to be happy for us. I remember thinking about dancing that day, with him in my arms. Honestly, I don’t know if I did. 🙂 It was sort of dreamlike. Yeah, the loving well thing. The Lord just keeps bringing it back to me. If I could be remembered for one thing, it would be, she loved well. Means so much to find out that you’d be thinking about my posts days after reading them. Thank you–with all my heart–thank you. Guess what? This morning, while we were porch-partying, I spotted The First Yellow Leaf. It was in the middle of our green grass in the front yard. I thought about you. Who’d ever think you and I would get so excited about a single leaf! Yes, it starts! Your smile says it all, Julie!! Congratulations to all, I know Rilynn, is going to be a great big sister. I can relate with the prayer you prayed in the labor room, with the same results. What an awesome God we serve. Indeed, He has rearranged my priorities many times, and has to do so even now. Enjoy making memories, and continue to dance with those grandchildren. Thank you, Sue. It’s so good to find out I’m not the only one the Lord “messes” with. 🙂 He just keeps on reshaping us, doesn’t it? Sending you a big hug and so much love. On Julie Girl…even though it’s been 21 years since my heart was enveloped with love for our firstborn grandson, I can still remember that consuming love! 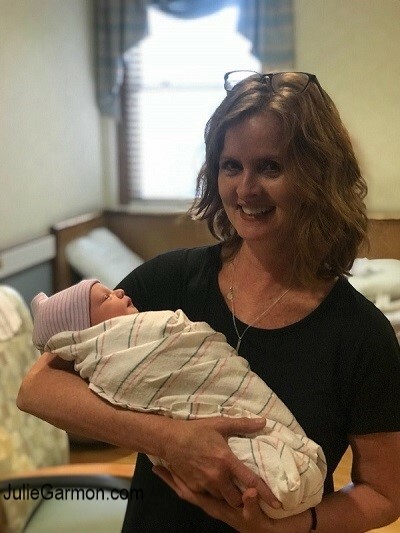 Four times since then and each one I can still remember those first moments when love for that newborn I was holding just oozed from my heart…Can’t help it, it’s a grandma thing! I was up early and in my Prayer Closet/War Room first thing, humbled that words weren’t necessary, just sitting in His Presence knowing deep in my soul that He knew where my heart was and He has this and all of my Grands (21, 18, 16, 14, 11) in His radar! What a Mighty God we serve indeed! Humbling! Do you realize the wisdom of your words, Brenda? They touch a place deep in my heart. I KNOW what you’re saying is True. And you went through this five times. Whew……..
Love the moment you shared with your daughter. You gave her such a great response, reminding her that she’s a good mama and that God’s in control. Your words probably curled up in her heart and settled her down. Thank you for reading this post, and for taking time to share your heart with us. I’m just now beginning to experience the kind of early morning prayers you’re talking about– when words aren’t necessary. Oh, Julie, I’ve missed you, too, and prayed for you and your family. I, of course, know firsthand the cause of your silence. That joy of grandparenthood cannot be compared to anything else in our life. Oh, becoming a mama blew my heart apart, for sure. But becoming a grandma … oh, just wait until the first time Caleb, as Behrgen (our first grandson, 2 1/2 yrs. now) did today, with no prompting, throwing his arms around me and saying, “I wuf you, Gramma!” Life’s noises hush, life’s wants and needs melt together into a pile of slush. My grandson loves me enough to tell me himself! Writing has become a priority, instead of being hidden on a shelf and just dusted now and then to keep it from growing moldy. We’re headed to the mountains for a few days tomorrow, and when we come home, major changes will be occurring in our home and in my life. A schedule will be posted where my husband and my uncle (who lives on our property and doesn’t understand my need for solitude and has a key to the house) can see it clearly. I menu will be made and posted with no substitutions. A revised budget will be put into effect and posted (just for hubbie) and strictly adhered to. I can’t EVEN imagine how I’ll feel when Caleb starts talking–to me! Grandma Jewels, congratulations to you and all your family!! Caleb is beautiful. God is so good. I’m so happy for all of you. I missed you and just kept on praying for all of you when I didn’t hear anything. What joy to read your beautiful words and see the beautiful pictures! Your words brought back the memories of how I felt when I looked into my first grandson’s eyes almost 30 years ago. And our youngest turned 27 last week. I was sitting on the porch the morning of his birthday remembering his birth, and thinking, how could the years have evaporated like the morning dew? Thank you, so much, for being happy with us. Hugging you in my heart. So THAT’S what you’ve been doing instead of writing your blog!!! Congratulations!!!! Joy unspeakable!!!!! So much joy!!!!!! So much love!!!!!!!!!!! You look young enough to be his mom and you radiate glory. Glad for the wonderful new hush and peace and melting and rearranging and youth renewed–live it, lady! Thank you, thank yo! A million thank yous Jan.
Congratulations! I’m also a Julie and pushing 60 (59)! 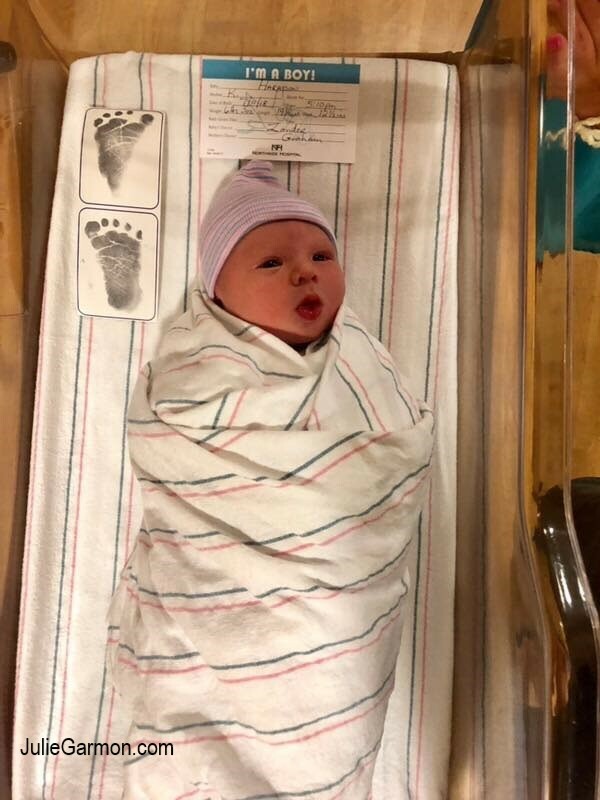 My husband and I just became grandparents for the first time on Aug 2 when my son and his wife had a baby boy (9lbs 13oz). I’m so thankful for a safe pregnancy and delivery of a healthy baby! Seems like I’ve waited for this a long time and wasn’t sure I’d be here to see it happen. I had endometrial cancer in 2004 and after several surgeries and radiation, I’m healthy and thankful! Now to be able to play with my grand baby!! God is so faithful and loves us so much!! I’m so thankful your prayers were answered and your daughter was able to experience pregnancy and deliver a healthy baby! I so enjoy reading your encouraging and inspirational posts and look forward to hearing about your “Grandma Jewels” adventures! My Grandmother name is “JuJu) but I will lovingly respond to anything that little one calls me! I’m so sorry it took a few days to respond. I was out of town. 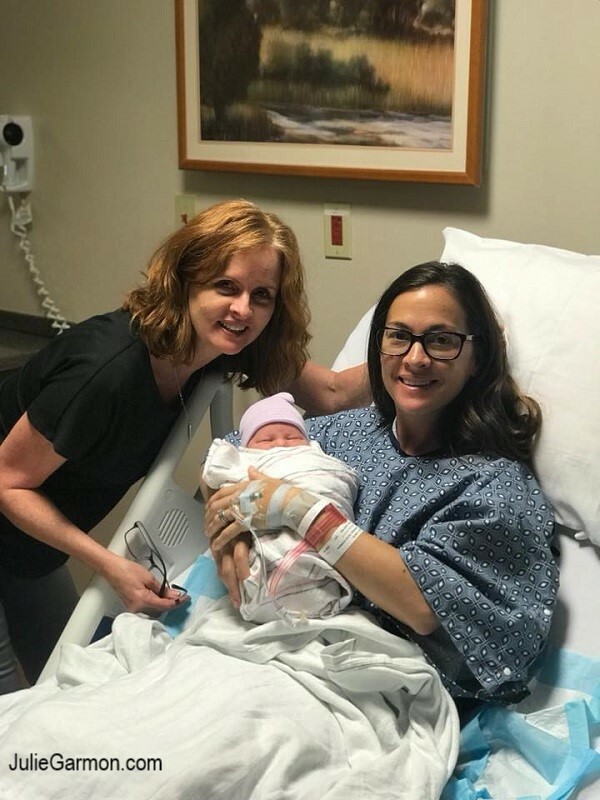 Thank You, Lord, for healing my friend Julie–and for bringing a new grandchild into their lives. And he’s almost 10 pounds! Giving you a hug in my heart. Thank you, Julie for this reminder of what is truly important. While going through chemo, I wrote a book about my parents’ struggle to keep their marriage together while my dad was a guard on Air Force One during the JFK/LBJ era. Naturally, I thought agents would jump on it, but the replies to my query letters run along the lines of, “I like your concept. What is your platform?” I, age 64, had to do quite a bit of research to figure out exactly a platform is! So, I started a blog, but it’s been very frustrating. I don’t want to be Somebody. I’m happy in my quiet life. I just thought people would enjoy this story. Anyway, your post reminded me. God gave me the book. It may be that He’ll find a way to publish it, or it may be just for my family to read, or, more likely,a way for Him to get me through chemo. But, you are so right. I need to stop chasing publication and “chase Him.” You’re such an inspiration, Julie! Thanks! I read your precious note yesterday while sitting in my car in front of a doctor’s office. (Just transferring records.) And I was so touched. You write about this book–even in the form of a comment–with such passion. I sorta feel like I know your heart. You were obedient. You wrote. You’re letting go and letting God right now. I can tell. I’m so proud of you. Not only did you write while going through chemo, you completed the book. I’m giving you a big hug right now. Hope you can feel it. Yes, yes, yes, yes to everything you said. 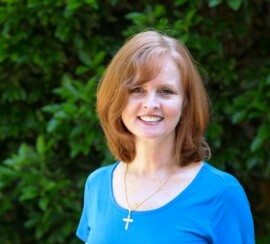 THANK YOU for praying, Shelli. My heart is being made over. Well said, friend. Well said. God is so faithful. Enjoy His bountiful blessings. thank you! Love you, Lynne. I never thought about that! The only day of the year that rhymes. Neat! Thanks so much.